An effective oil painting can be completed in half an hour and with just five oil colors. This oil painting demonstration required the simplest art materials, ideal for the student who prefers to use basic materials. 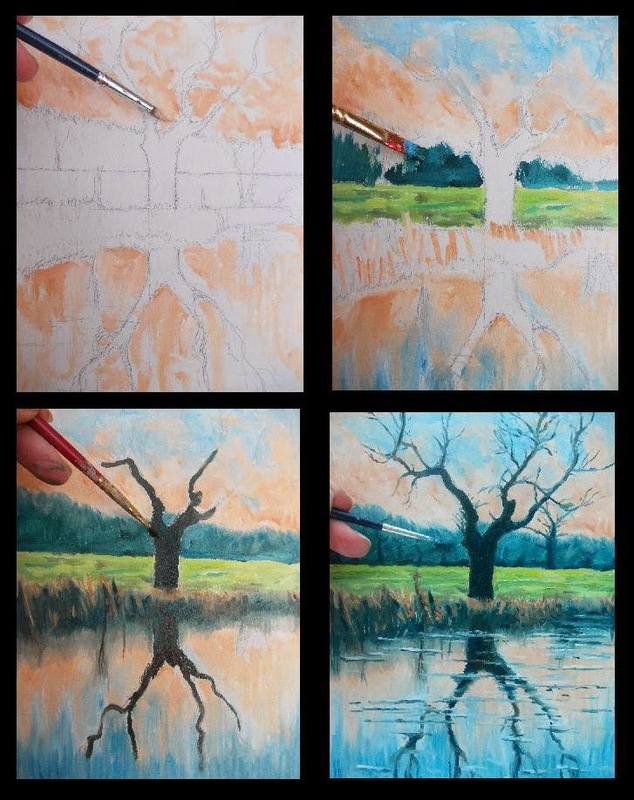 The scene comprises a tree next to a river, ideal for painting reflections. 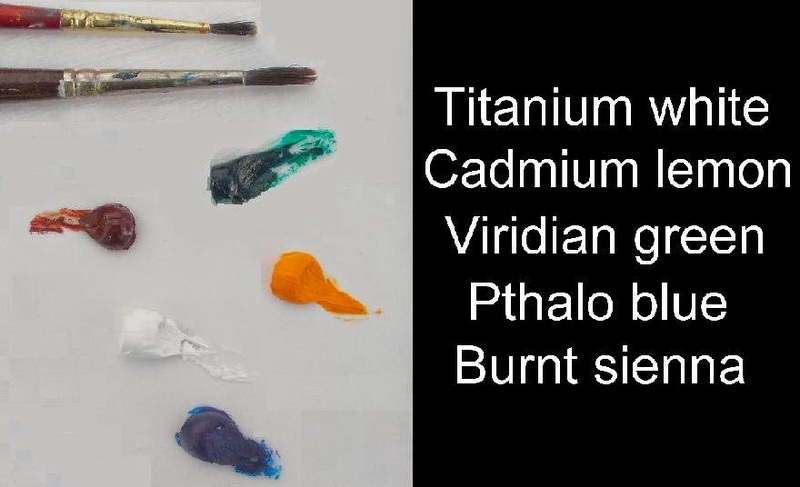 Oil colors: titanium white, pthalo blue, burnt sienna, cadmium lemon and viridian. Only a flat bristle no. 6 and round sable no. 3 were used. Artists’ spirit was needed only for cleaning the brushes at the end of the session. I had primed a small panel with two coats of gesso before beginning the painting. The panel measured 7x9inches. A HB pencil and eraser was needed for sketching in the composition before laying down the paint. 1 I worked from light to dark and therefore began with palest areas of the painting. I mixed a little burnt sienna with mostly white and plied this uneven mixture over the sky area and corresponding reflections. I applied this color thinly towards the top and bottom of the painting as I wanted to introduce another color in these areas. 2 I then mixed a little pthalo blue into white and introduced this color unevenly at the top and bottom of the picture. With a clean bristle, I smudged together the warm and cool colors careful to avoid contamination that could result in muddy mixture. I blended the colors more smoothly on the areas of water, to suggest reflections. I flicked the bristle in vertical strokes. 3 I then mixed a little viridian and cadmium lemon into white and dabbed this warm green onto the field in the background with a fine sable. 4 I mixed burnt sienna and a little white and made vertical strokes around the reedy area at the foot of the tree. To add contrast, I plied on viridian, pthalo blue and a little white for the trees in the background. Areas of color were softened where they met, such as the treeline and sky. 5 Burnt sienna, pthalo blue and viridian were mixed for a deep, rich dark and this was applied onto the reeds at the foot of the tree. A clean bristle was used to smudge out this dark color into the pervading reflection color, to suggest a glassy surface to the water. 6 The surrounding to the tree trunk and its reflection sets up the tree to make it look more dramatic. Any niggles should be ironed out before beginning the tree itself. I mixed pthalo blue, viridian and burnt sienna to create a rich black and I applied this dark onto the tree trunk initially. I worked the same color for the tree’s reflection to ensure the subject and its reflection accorded. 7 A narrow brush was used for the branches and twigs, moving the brush into the direction of the tree’s growth. Care is needed not to get carried away with adding too many twigs or the area could get confused. The secret is to generalize. Look for clumps and feather out the dark color to suggest ‘gathers’ within the tree. 8 And now for the water. With a fine sable, I mixed a little pthalo blue with white and dragged the brush in small horizontal strokes to suggest disturbances on the water’s surface. I let some of the undercolor get dragged into the upper color. 9 With a separate sable, I mixed a little burnt sienna with pthalo blue and lightly applied horizontal bands over the water to contrast with the paler streaks. I allowed some of the underlying color to get dragged with the horizontal strokes to bring a fluid quality to the paint. 10 Finally I dabbed burnt sienna with a little white, to produce a rich, rustic color and applied small, vertical strokes over the stalk tops. This warm color provides great contrast with the cool colors in the background. An effective oil painting can be produced with just five oil pigments as can be seen in this demonstration. Basic art materials were used. This painting took around half-an-hour to do. The secret is a strong, striking composition that will carry the basic oil colors. This tree also provides stark contrast against the background.